This dish is inexpensive, colorful, and intensely flavorful. You can feel free to vary the vegetables you use, depending on what you like and what’s in season. The sauce has a bit of heat to it, but it’s not overly spicy; I made it to the taste preferences of my kids, so you may feel free to tinker with the amount of sambal you add to yours, or add extra tableside to the dishes of those who like their food on the spicier side. Combine the rice and the 3 3/4 cups stock or water in a medium saucepan. Cook according to package directions. In a small bowl, combine the ingredients for the sauce (sambal through tamari). Set aside. While the rice is cooking, heat the coconut oil in a large skillet. Add the broccoli and stir-fry for 2 minutes; then add the shredded carrots, diced peppers, mushrooms, and garlic. Stir-fry for 5-7 minutes, then add the 1/4 cup of stock and cover the pan. Cook for an additional 2-3 minutes, until the broccoli is crisp-tender. Stir in 1/4 cup of the sauce and remove from the heat. To assemble the dish, divide the cooked rice evenly among 6 plates. Top with the stir-fried vegetables. 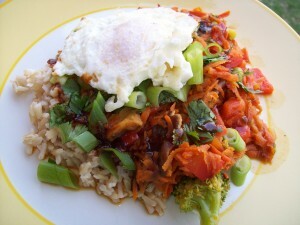 Place an egg on top of each dish, then allow each person to add extra sauce, scallions, and cilantro as they prefer.